BSNL Kerala Circle has decided to launch Balance Based Tariff (BBT) for 'Per Minute GSM Prepaid Mobile Plan' Customers with effect from 1st May 2015 onwards. Now BSNL Customers can enjoy reduced voice call tariff without using any Special Tariff Vouchers (STVs) or Special Recharge Coupons. 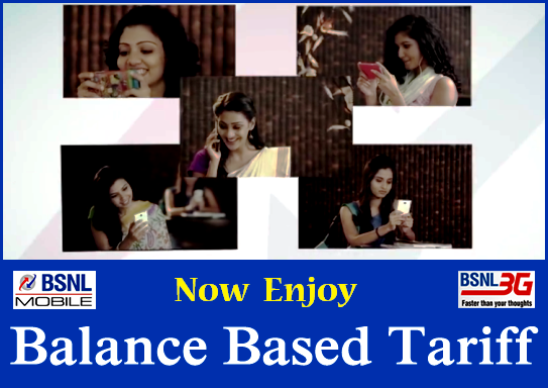 Balanced Based Tariff (BBT) allows prepaid mobile customers in 'Per Minute Plan' to make outgoing calls at reduced tariff without using any Special Tariff Vouchers. The reduced call tariff will be available only from Home Circle and it is not available while in roaming. The above tariff will be implemented from 01-05-2015 onwards for BSNL GSM Prepaid Mobile customers in Kerala Telecom Circle.